The English Springer Spaniel temperament makes this dog a joy to be around. He likes to hunt during the day and give his family kisses when he comes home at night. If his master isn't a hunter, no problem – anything he does outside to keep his mind and body active is fine by him. The English Springer Spaniel belongs to the land spaniel family. Sydenham Edwards was an illustrator of natural history. In 1801, he stated that land spaniels should be separated into two types: the Springing Spaniel and the Cocker Spaniel. During this time, English Springer Spaniels and Cocker Spaniels were born into the same litter. The purpose for breeding both dogs was for hunting. While the smaller Cocker Spaniel would hunt woodcock, the larger Springer Spaniel would “spring” game into the air. A trained hawk or falcon would then fetch the game for the hunter. Affectionate – Bad day at work? The English Springer will snuggle up to you and make it all better. Cheerful – He has quite the bubbly personality that could put a smile on anyone's face. Alert – Chances are, on an average day, trouble is not on the way; but if it is, the English Springer will jump to attention. Intelligent – English Springers are very smart dogs, which makes them easier to train. Attentive – He pays attention when you need him to, which is also a valuable personality trait when it comes to training. Active – He's not the kind of dog who wants to lounge in the sun all day. He's an athlete who wants to run, run, run! The English Springer temperament makes him a great family dog. He loves to be with his people, so don't leave him alone for long periods if you can help it. He will get lonely, and loneliness can only lead to him acting out. If your household is one in which everyone works long hours, you should Crate the English Springer to prevent his destruction of your property. 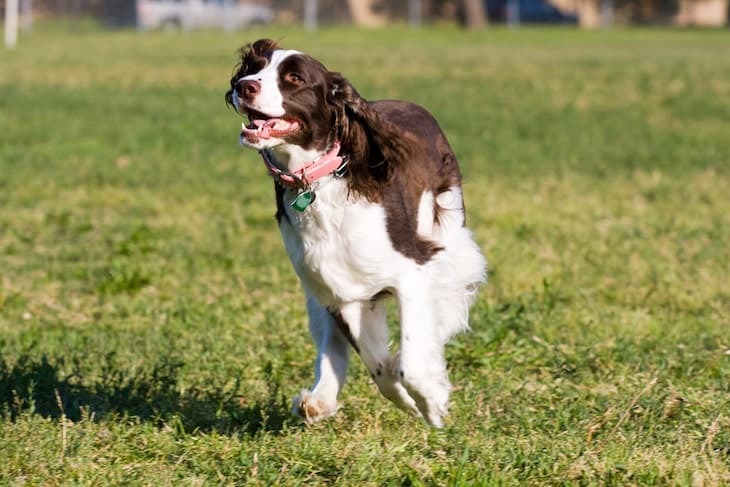 Most spaniels have the urge to retrieve, and the English Springer is one of them. If left unchecked, he may channel this urge into a chewing problem. To prevent this from happening, play fetch with him often when you're engaging in outside play. If you take him hunting regularly, then that too should work to quell the urge. One thing about the English Springer is that he's not the best with cats. He may do just fine with cats if he's socialized with them early on. However, perhaps because of his hunter nature, he tends to not mix as well with them as he does other dogs. Another aspect of his hunter nature is that he loves the water. So if one of your favorite activities is going swimming, he'll be right there beside you, swimming along. Above all, this is a caring and trusting dog, and you can see it in his eyes. He can be tough when necessary, but he's ultimately a people-pleaser who will do whatever it takes to make his master happy. Because the English Springer is so active, his trainer needs to maintain control at all times. Else, he'll just wander off and explore more of his environment. His highly intelligent nature demands regular training on new things to deter boredom. You definitely don’t want a bored dog, as boredom can lead to bad behavior. Socialize him early to ensure that he can get on well with other animals and people from an early age. You need to brush the English Springer weekly to keep his coat looking healthy and shiny. Weekly brushing also cuts down on the number of mats he gathers in his coat. Whether you do the grooming or you hire a professional groomer, the English Spaniel should be regularly clipped. Areas of particular importance include the feet, under the tail, and around the head and neck. And, as with all dogs, don't forget to trim his nails regularly. Long nails can make walking uncomfortable for him. 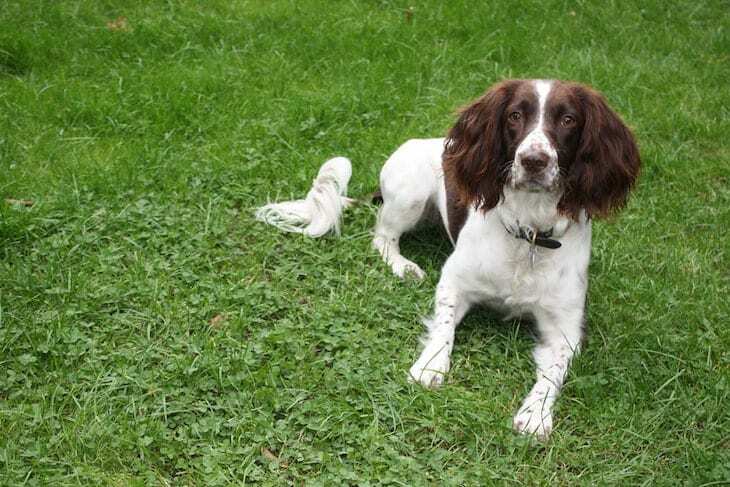 Due to the English Springer Spaniel temperament and his love for the outdoors. As such, most of his exercise should take place outside. Because he loves to be outside, he copes well with either apartment life or a big backyard. He doesn't care where he hangs his head, so long as he gets to be outside for a majority of the day. Exercise him daily, and he'll be a happy pup. He enjoys lengthy play sessions and long walks. The average English Springer Spaniel size is 19 to 20 inches high at the shoulder. A healthy weight for him is between 35 and 50 pounds. While most English Springer Spaniels are perfectly healthy, you should be aware of the conditions to which they are vulnerable. Such conditions include the ever-common hip dysplasia, and Progressive Retinal Atrophy (PRA), which can lead to full or partial blindness. Elbow Dysplasia – A developmental abnormality of the elbow. Retinal Dysplasia – An eye disease involving the retina. Can cause cataracts or glaucoma. Phosphofructokinase deficiency (PFK) – A very rare disease affecting the muscles, typically brought out in its earlier stages after exercise. Ear infections – Caused by infrequently cleaned ears. Keep an eye on the English Springer's diet, as this is a breed that is prone to gaining weight. The average life expectancy for a healthy English Springer Spaniel is between 12 and 14 years. The English Springer Spaniel price tag hovers between $700 and $800. As far as, English Springer Spaniels for sale goes this is a pretty reasonable price. When searching for an English Springer Spaniel for sale, be careful about who you choose to buy from. The last thing you want to do is pay good money for a dog in bad health. If you’re in the market for a spaniel, you can easily find one through a rescue or adoption agency. 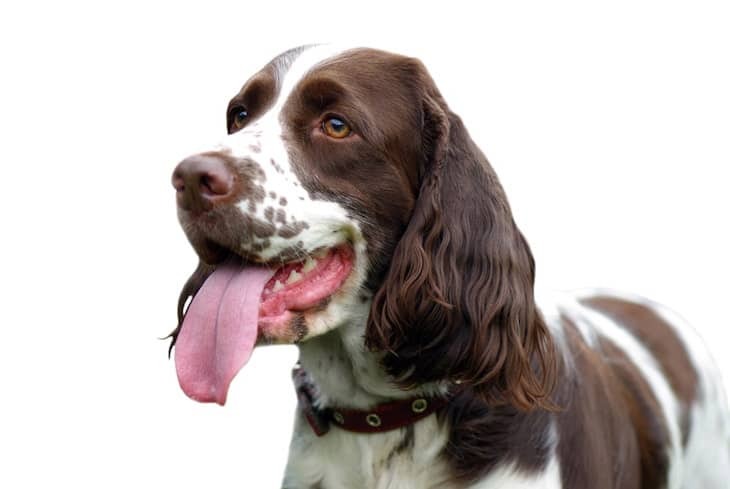 In addition to the English Springer Spaniel, you might be interested in his close cousins: the Welsh Springer Spaniel, Brittany Spaniel, or English Cocker Spaniel. Whichever breed you prefer, there is a chance you will find one available to adopt from a rescue organization or local shelter. For one such organization, check out English Spring Rescue America, Inc. Established in 1998, this nonprofit works to find homes for English Springers with emotional and medical needs. When choosing a breeder in your search for English Springer Spaniel puppies, be sure to ask lots of questions. This is not the time to be shy. Find out everything you can about the health certificates they have on file, as well as any training that has been given. Another great question to ask if there is anything you should know about the litter the puppy you’re interested came from. Example: if another puppy in the litter has hip dysplasia, there’s a good chance that others in that litter may have it, too. Make sure the breeder’s home is clean and that the puppies have been well cared for. The English Springer Spaniel temperament makes this dog a joy to have around the house. He's a family dog, so he likes to be inside with his people. But what he really loves is to be doing things actively outside. Be careful when feeding the English Springer, as this is a dog who is prone to gaining weight. A healthy weight for him is between 35 and 50 pounds. A good way to keep his weight in check is to heap on the praise, not the treats when he does well with training. And do well with training he should, as he is highly intelligent and loves a challenge. Just be sure to establish early on that you are the master and he is to obey. Else, his curious nature may cause his attention to wander.